DYNASWIRL ®Gas-Liquid Separator | Dynaflow, Inc. The DynaSwirl® free vortex gas-liquid separator is developed from the proprietary vortex generation technology DynaSwirl® of Dynaflow, Inc.®. It has the capability to separate low void fraction gas–liquid mixture for many different applications. 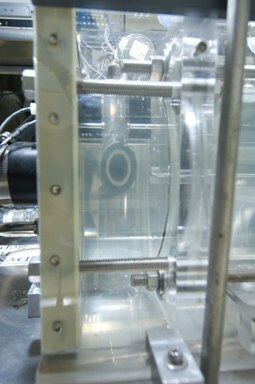 Most recently, the DynaSwirl® gas-liquid separator has been tested under reduced gravity on a NASA mircogravity research flight and successfully demonstrated it readiness for supporting NASA space mission. 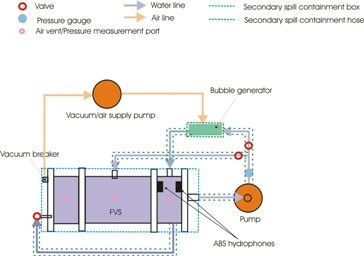 Figure 1 shows the demonstration setup for test of low void fraction gas–liquid separation under microgravity. In this setup, the free vortex separator (FVS) consists of three chambers connected in series. 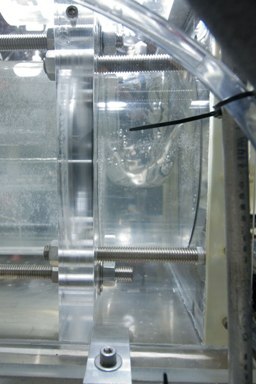 In the center is the DynaSwirl® “vortex” chamber, which consists of two concentric cylinders. The gas-liquid mixture is introduced in the space between the two cylinders, and the swirling flow inside the inner cylinder was generated with tangential slots on the inner cylinder. This configuration makes the vortex core very stable even at low flow rates. For the separation application, a “gas finder” chamber is used to extract gas from the vortex core and supply liquid to the “vortex” chamber to replenish the void generated from the gas extraction. The orifice between the two chambers is used to remove gas and supply water. To enhance the gas extraction, the “gas finder” chamber is also connected to a vacuum pump so it is under vacuum and gas could be removed at faster speed. 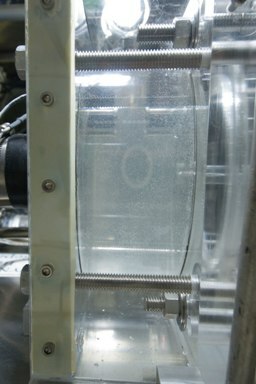 A “mixing” chamber is connected to the other end of the “vortex” chamber through a larger orifice. It was used to receive before the test a mixture of gas-liquid obtained with a DynaSwirl® bubble generator, and during the test it was used as a reservoir to collect the gas reduced mixture (which exits from the larger orifice of the “vortex” chamber) which is then pumped back to the “vortex” chamber for further gas-liquid separation. Figure 1 . Demonstration setup of the DynaSwirl® separator. Figure 2 shows the gas bubbles being extracted from the vortex core under zero-gravity. As the gas extraction progressed, the vortex core shrunk and the number of visible bubbles kept decreasing. Figure 3 shows a comparison of the content in the separator before and after the separation under microgravity condition; the left image shows the initial mixture in the separator, which has significant amount of small bubbles, after the separation, only clear liquid remains in the chamber as indicated on the right image. Figure 3. Comparison of the content in the DynaSwirl® gas-liquid separator before (left image) and after (right image) separation under microgravity condition.